Bringing you reviews, a look behind the curtain, and celebrating the magic of theatre. Where were you on 9/11? It's a question nearly all of us can remember vividly. For Kevin Tuerff, he was of the 6,500 unexpected visitors who were diverted to the tiny town of Gander in Newfoundland. Tuerff was returning from a Paris vacation with his then partner, also named Kevin, to their home in Austin, with a layover in New York. His Air France flight was hours away from landing when the plane suddenly switched directions and headed north. His story, along with many others, inspired the hit musical Come From Away. The character Kevin T, played by Chad Kimball, is inspired by Tuerff. After his experience in Gander, Tuerff recently wrote a memoir, Channel of Peace: Stranded in Gander on 9/11. The book recounts his time spent in the Newfoundland community and the kindness from complete strangers. In our conversation below we discuss his recent book tour, his time in Newfoundland, his desire to help refugees, and passion to spread kindness. LM: You just finished your Newfoundland Kindness to Strangers Tour. What was it like to head back to Gander? KT: Every time I go back to Gander it is a wonderful experience. Specifically on this time, I've been back to Gander and Central Newfoundland before, but I wanted to see more of the province. I started off in St. John's and then I had a series of 17 events over 14 days. I went all the way up to Lewisporte and Fogo Island. I was able to see a lot more of the geography and landscape, which is beautiful. Gander is not on the ocean. It's about 45 minutes away, but the coastline around St. John's and the areas nearby reminded me of Western Ireland, which I've been to a couple of times with my family. I really enjoyed it. The weather was perfect. August is a great time to go there. I also wanted to hear more stories from other Newfoundlanders and find out why are these people so darn kind and how could I export some of that back to the United States. LM: What has it been like to hear all of these different stories and accounts of 9/11? KT: The writers of Come From Away, David Hein and Irene Sankoff, they regularly say they spent about a month there and got hundreds of stories and really there were 16,000 and it's so true because everybody that I would come in contact with I would just say, "Well, what were you doing that day?" because there's no doubt in my mind that everybody was doing something. They were volunteering and that is what's unique about the ratio of people that live there to the stranded passengers, the refugees like me. Everybody did have a story. I don't think I met a single person who sat home, watched television, and ate popcorn. They were either volunteering for a specific organization, contributing food or clothing, or working at the airport for five days nonstop. They all remembered as vividly as I do. LM: You considered yourself a refugee during the time and 25% of the net proceeds from Channel of Peace: Stranded in Gander on 9/11 are going to the Gander Refugee Outreach project. Why are you passionate about this? KT: The whole issues of refugees wasn't really on my radar for the last 15 years. After going to a spiritual retreat about a year ago I opened my eyes to the global refugee crisis. As I tell people, on 9/11 we weren't seeking asylum in Canada, but we certainly needed food, clothing, shelter, and information and those are the things that we have in common with refugees. As sort of horrific as an American as that experience, which for me lasted seven days, the average person in a refugee camp across the world is spending more than five years in a situation kind of like we were in. I'm just trying to call attention to that in any way that I can and especially where it really clicked for me was when I went back to Gander with the cast and crew of Come From Away. This was a couple of weeks after my spiritual retreat that I went on that's when I talk about in the book how my friend, who was my caretaker and my hero back in Gander, he picked me up to take me to dinner and then he said, "If you don't mind I've got to do an errand." I said sure, so we pull up in his truck to this small, tiny house in Gander and I said, "Well, what are we doing?" and he said "Well my church, we've adopted a Syrian refugee family here in Gander and I'm volunteering." Within minutes here I am and I'm talking to this Syrian refugee family through Google Translator app and the irony of all of this is that the person who is there helping me with the translation and working is no other than Diane Davis, who is one half of the character Beulah Davis, who I hadn't met before either. In fact, she didn't really know that she was a character in the show and I think I was the one that said I think you're in the show. That character is a composite of many teachers, but there's no doubt in my mind that Diane is part of it, she was a clear leader back then. I realized wow this tiny town of Gander, they are once again, 15 years later, this wasn't a one time thing where they step up to help strangers, they are doing it again. At a time where there's 22 million people who are refugees outside of their own country across the world I thought this is how we are all meant to treat each other. LM: With all of the recent natural disasters recently, you traveled back to Austin, Texas to help with disaster relief from Hurricane Harvey. I know that city holds a special place in your heart. Tell me about that experience. KT: When I came back from Gander in 2001 I said, "Would we do the same thing?" Would a small town in Texas do the same thing? It was heartening to see during this recent hurricane, I happened to be in Texas and I felt compelled to step up and volunteer at the Red Cross shelter in Austin and all of a sudden it was like it was meant to be. Six buses came into this shelter and they had been driving 200 people on these buses for twelve hours for a ride that would normally only take over two hours because of the torrential rainfall and the flooded streets and the bus got stuck in the mud, so these people hadn't eaten, they had wet clothes, and so I thought this is my time to help give back and do as others did for me. I was glad I could help out. The situation there is still very dire and they still need a lot of help and Florida, as well. I'm so pleased that people do help out each other regardless of age, religion, ethnicity, but why can't we do that all of the time? Why do we have to wait for a natural disaster or terror attack for us to step up and help each other? LM: To help spread kindness, you started the Pay it Forward 9/11 initiative in 2002. Tell me about what it has been like for you to see people participating and sharing random acts of kindness with others in their communities? KT: It's very inspiring. I call it the ripple effect of Gander. The first ripple for me was in 2002. What they did planted a seed that I decided to launch at my company in Austin. I couldn't make it back to Gander to say thank you, so I said, "Lets try to pay it forward." In the book, I talk about some of the best stories of 15 years of our staff going out in the community. I would give out $100 bills, just like they mentioned in the musical, and I let them go out into the community and come back and talk about it. 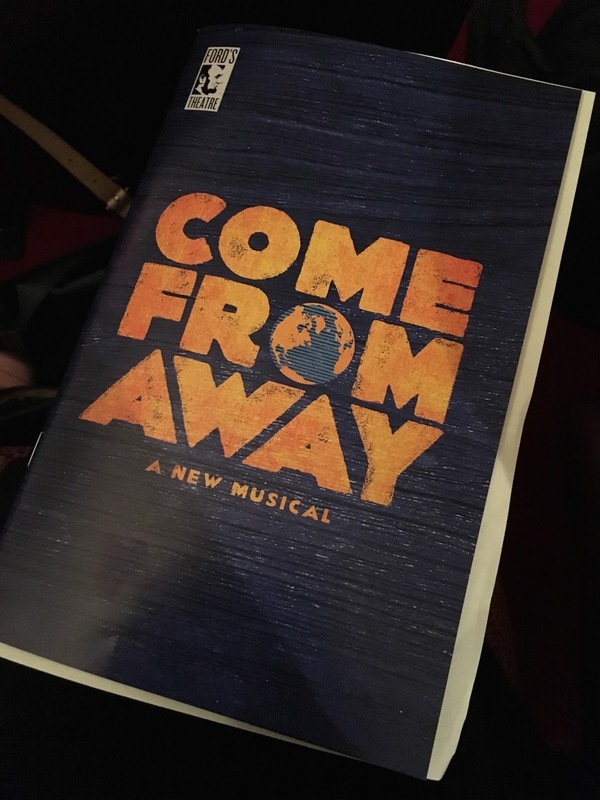 What has been super cool is now I'm no longer with this company and now here we have the musical and now the cast and crew of Come From Away, for the second year now, they have picked up my tradition and it has been really heartwarming to see their reaction. One of the cast members they did their three good deeds as they were assigned, but then they said, "After I got into it I couldn't stop myself. I wanted to do more. It was just so much fun and so powerful." So I love that and I love hearing stories like a woman from Alaska who did it with her daughter. It certainly has room to grow, but the fact that we have been keeping it going for 15 years, when I hear stories of people, even a woman who just came to see Come From Away last weekend and she said, "I'm bringing this to the UK. We are going to do this in the UK next year." So that makes me very happy. LM: How many times have you seen Come From Away? KT: I've seen it 21 times over four years, but I'm going again tonight. I'm bringing a friend of mine who is coming in from Dallas. Generally, I like to meet people after the show. What I do is people are coming in from out of town and what I ask people to do is I will meet them for a drink after the show and answer questions and tell them the rest of the story if they consider making a donation to the Gander Refugee Outreach to help the people of Gander. So that has been fun to talk about the show, get more people to see it, spread the message of kindness, and also give back to Gander. LM: What was your reaction when you first met Chad Kimball, who plays your character. KT: The first time I met him was at La Jolla Playhouse and I didn't get to talk to him until after seeing him perform on the opening night. It's an anxious feeling to wonder how the person is going to portray you, what are they going to look like, what are they going to sound like. Lucky for me, Chad is better looking, younger, dances, sings, he's very talented. Afterwards we gave each other a big hug and I got to meet his family and he got to meet my friends. I think he does a remarkable job and he has been doing it for over two years. LM: Had you visited Canada or Newfoundland before 9/11? KT: I had been to Canada a number of times, but only the Central and Western provinces, but never on the East Coast and I admit I didn't know where or what Newfoundland was. I didn't know much about Nova Scotia, even though my grandmother was born there. Now I'm an honorary Newfoundlander and I'm proud of that and I just love going back. I've made some lifelong friends there. LM: The song "Prayer" in the show is based upon scripture that you were humming in your head on 9/11 while sitting on the plane. What was your reaction when you first heard that song performed on stage? KT: I was in shock because I first saw it performed at Sheridan College in Toronto. That was the ultimate first goal was to just get it produced at the college and so I went to see the show there and then when the guy who was playing me comes out and starts singing that I couldn't believe it. I thought I knew that was true, that song, the Prayer of Saint Francis, was going through my head, but I never remember telling anyone that. I guess I did. I guess I told the writers and I just didn't remember, but it was a shock and it took the wind out of me. LM: After 9/11, did you ever experience any anxiety or fear when flying again? KT: I did not. What happened right after 9/11 was that almost everyone stopped flying. Everyone was so afraid that there was still going to be additional terror attacks and so there were planes that were being flown with like two or three passengers on them for weeks. It was in November of 2001 when I got a call from ABC News to come and be interviewed about what happened in Gander. They were interested in me because I had this video camera and footage of my experience there that I started recording while I was on the plane. I did some interviews while I was in town that week, so they wanted that and they flew me and the other Kevin up to New York and that plane was not full then. Like a lot of people, like Captain Beverly Bass, we will not let the terrorists win at this and succeed by letting fear change who we are. 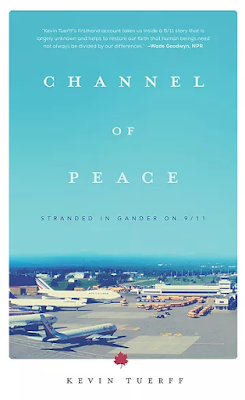 LM: What message do you ultimately hope readers take away from your book, Channel of Peace: Stranded in Gander on 9/11? KT: I think the message is that we need to really look at ourselves wherever we are and look at people who are strangers, whether they could be your next door neighbor who you have never met or they could be the person on the bus or they could be an immigrant or refugee. When I was a refugee and how I was treated by the Canadians, to me is how God wants us all to live and that is to be kind to strangers. I think we let fear so often take over our psyche and what's great about the Pay it Forward 9/11 initiative is that you break that fear when you approach somebody you've never known and you offer to buy them a cup of coffee. They are so taken aback, but then you see the big smile come on their face and they are so appreciative and they want to carry it on and you feel good too. If we could have a little bit more of that on a regular basis then that would be good. LM: You just finished your most recent book tour. Do you have other upcoming tours in the works? KT: I'm really hoping to do more public speaking. I was just invited to speak at a World Peace Day event in Atlanta with UNICEF and the World Council in Atlanta and talking more about the issue of migrants, immigration, and refugee crisis. I'm hoping to do that more across the country and I will be going back to Sheridan College in October where this all began, at least the production. I'll be doing a book discussion there in mid-October. LM: When you first saw the production in Toronto did you ever imagine that it would make it to Broadway and beyond? KT: No I didn't. In fact, the man I was dating at the time, he said, "Oh my gosh this is going to go to Broadway." I said, "No, you don't know Broadway. I've been to a lot of Broadway shows before and only Disney shows make it on Broadway." Boy, if I wasn't proven wrong. I'm thrilled that it is and it is a great honor to be a part of it and I love all the cast. They feel like they are family. LM: Aside from "Prayer", do you have a favorite song in the show? KT: I think "Welcome to the Rock" is so wonderful and I get choked up every time I see it and any given number of songs throughout the show. LM: During your different speaking engagements have you been able to meet any other people who were not on your specific plane, but on any of the other planes that were in Gander as well that day? KT: I have, in fact, it's remarkable. In Austin, I've met people that I knew of but I never knew that they were stranded there like I was until they had come to one of my book presentations. Just this past Sunday, I did a presentation at my new church here in New York and there was a man who said, "I was on your Air France plane. ", and his name was Kevin. He even proved it to me by sending me a photograph that he had taken out of the window. Like me, he was sitting on the righthand side of the plane and I have a picture in the book, I think it was a Lufthansa flight, and he sent me another picture just like it from a few rows down or up. I couldn't believe it so I've now met another person who stayed in Gander and had another great experience. I still keep in touch with some of the people from my plane too. I'm honored to be one of the 6,500 people whose stories are told, but when I talk to anybody who was there they all validate and agree that what happened there in Newfoundland was remarkable. LM: I saw on your social media accounts where you were recently in Gander for a documentary project. Can you tell me about this? KT: HBO Canada has signed onto air next April or so a documentary about the real characters in Come From Away, so they flew all of the Americans, Beverly Bass and Tom Stawicki, Nick and Diane Marson, and me, and the other Kevin, Kevin J, we all went back and we were all interviewed. We went back to the College of the North Atlantic with the film crew. As if my life isn't surreal enough already, going back and having a film crew follow you around for a couple of days, that was crazy. One thing I can tell you that is going to be really cool if it's included is they brought the Americans, Nick and Diane, Beverly and Tom, and Kevin and I to the legion where Beulah likes to hang out and volunteers. We sat there and had drinks and just talked. We talked about the musical, and our time, and there were just so many cool stories that I think people haven't heard that will come out in this documentary. To purchase a copy of Channel of Peace: Stranded in Gander on 9/11, click here. You can also follow Tuerff on Facebook, Twitter, and Instagram. Lauren McMillen. Simple theme. Theme images by i-bob. Powered by Blogger.